Well, this Flight Jacket definitely became my second skin. 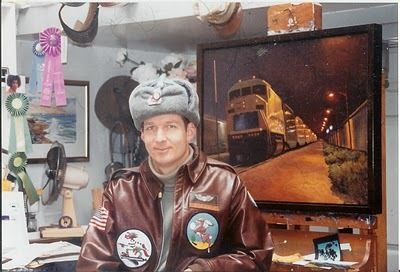 I made sure I wore it whenever it was chilly enough, and it even graced the cover of the Montecito Journal once when I had a solo plein-air nocturne exhibition at Montecito Frame and Gallery. This was a picture that was taken of me in my studio when I had a painting accepted into the California Art Club Gold Medal Exhibition. I am wearing the Russian Infantryman's Hat which I've worn for years now; nationally and internationally, while painting my plein-air nocturnes. (My estranged in-laws brought it back from the former U.S.S.R.). You can get a glimpse of the front of my jacket with the "San Michelle" Bell given to my Mom by Kenny Frost. He collected it while on R&R in Corsica. The pilots use to hang them (as I had done) from their lapel, for good luck. The painting behind me is from my 1999 Master's Thesis, at C.S.U.N., called, "Sleeping Metrolink". I will approach it as an urban nocturne later on.